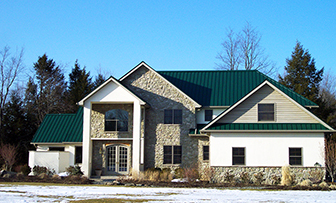 Metal panels are buildings that house farm animals, whether cattle, hogs or poultry. But while the sheer number of such installations shows how well-suited metal is to this environment, animal confinement imposes specific challenges on panels that aren’t required considerations for residential or commercial uses. When considering metal panels for a barn or other animal enclosure, here is what you should keep in mind. Why do so many agricultural buildings use metal panels? Longevity: Although metal panels can cost a bit more than some other materials for roofing and siding, they are more durable and last three to four times as long—up to 60 years. And unlike corrugated fiberglass panels, metal doesn’t get brittle after years in the sun. Cost Savings: Metal is a much more cost-effective material than wood and because it doesn’t need to be replaced as often. Thus, additional cost savings are realized. Suitability for the environment: Panels made from wood, aluminum and fiberglass go not feature zinc and will therefore not withstand the highly-corrosive animal confinement environment like metal panels will. What makes animal housing such a challenge? Animal waste has a high ammonia content that can start to corrode metal in as little as five years. With roofs, this corrosion is fueled by airborne fumes; on walls, the culprit is manure or dirt lying against the panels for extended periods. You can minimize both problems with good ventilation and regular maintenance, including keeping the panels clean and immediately repairing any damage. 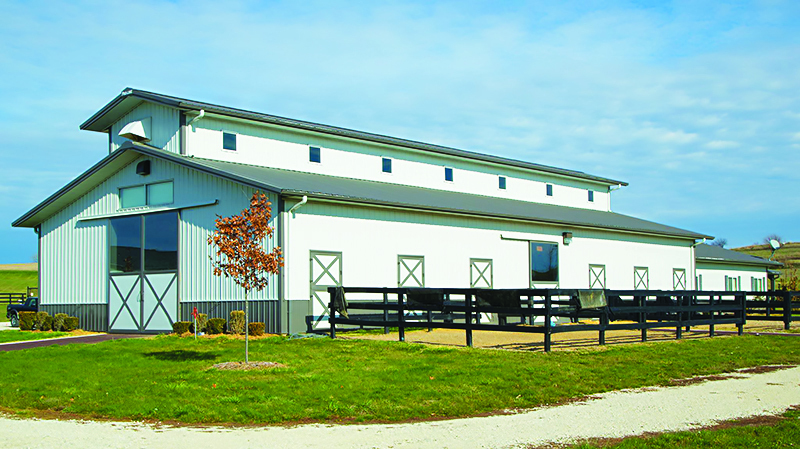 Panel Coatings: More people are opting for Galvalume panels for their livestock housing projects than ever before. And while Galvanized panels perform better than Galvalume in high-ammonia environments such as hog confinement, Galvanized. panels are susceptible to white rust (chalking) if exposed to water prior to installation, which is not an issue with Galvalume panels. For this reason, many are pairing Galvalume panels with a protective, self-adhesive moisture barrier like ABC’s Drip Stop product, which is applied to the panel’s interior before it is roll-formed. This membrane absorbs moisture when relative humidity (RH) is high, and then releases it back into the atmosphere when the RH falls, thereby preventing the damaging moisture from directly touching the panels. For hog or cattle barns, where dirt and manure tend to pile up against walls, another protective option is to install a polycarbonate (PBC) panel on the inside of the metal wall panel to reduce contact, making the metal panels easier to keep clean. No matter which panel you choose, be sure you understand how the coating is measured so that you optimize the durability and long-term corrosion-resistance. The best options are the G90 Galvanized or AZ55 Galvalume panels, which have been compared in this article. Panel Thickness: The 29-gauge panel is most commonly used for animal confinement, but as mentioned in this article on metal panel gauges, nominal 29-gauge panels come in a range of actual thicknesses. For best results, look for one that’s at least .015 inches thick. Design: The design of animal confinement structures is supremely important and can have major impacts on the viability of the building. Dropped ceilings with sophisticated ventilations systems are said to increase efficiency and satisfy environmental run-off inspections, therefore maximizing return on investment. These structures can also be designed to help eliminate ammonia fumes and corrosion—common occurrences in buildings with poor air flow. Warranty: As with any purchase, it’s important to check the warranty exclusions when selecting any kind of panel for your projects. For instance, the warranty on a Galvalume panel may not apply when it’s subjected to animal waste or other corrosives. Again, good ventilation and regular maintenance will minimize the chance of problems. For more information on ABC’s agricultural products, please visit our website or contact your local representative today.